One of the many things I love about summer is our weekends at the beach. For 5-6 hours every Saturday and Sunday we are on the sand, in the water, walking the boardwalk. With no phones, no TV, no iPad. Just each other. And while it’s not all unicorns and rainbows to be sure, it is completely and utterly disconnected. We are fully engaged with one another, fully in the moment, fully face-to-face. And though I swear I’m going to keep that going once summer ends, I find it way more challenging to do so. Days are more structured. There’s homework. And after-school activities. And weekend “busy-ness”. So I find myself looking for ways to carve out pockets of time that give me that same feeling of connectedness – even if it’s for just a few minutes – that I get all summer long. It’s why I drive Noah to school every morning – so we can talk, or just listen to music. It’s why we have “game night” at least 2-3 times a week. And it’s why I let Noah help me cook dinner whenever possible. Now – let’s be real with that last one. When I say “help”, believe me I’ve done most of the prep. And this is not the time to bust out a complicated dish with a 27-step mise en place. 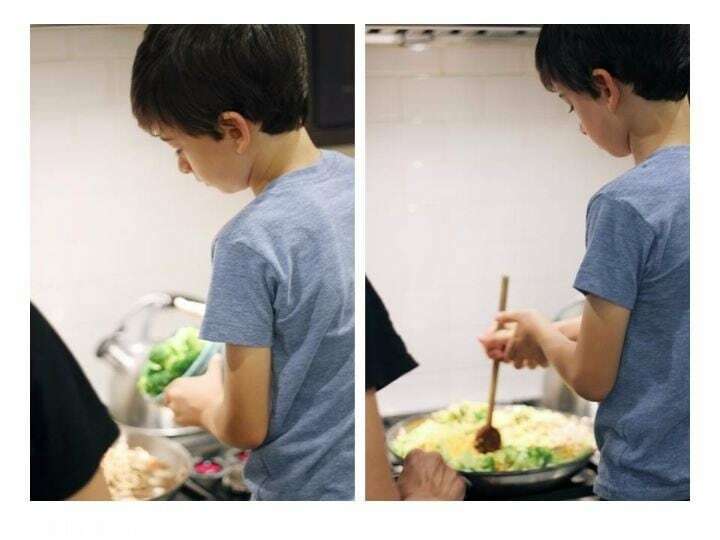 And, unlike baking – where it’s mostly measuring ingredients, operating the mixer and scooping out dough – I’m not letting him dice onions or cut up raw chicken. 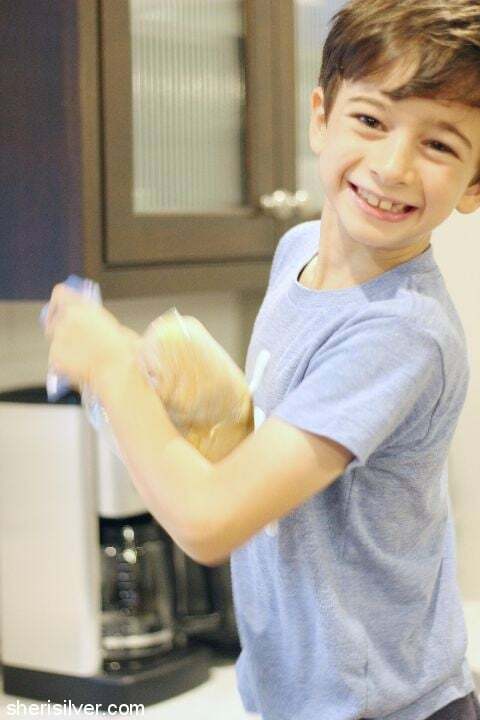 But Noah genuinely enjoys being in the kitchen, and so when I can I let him participate. And to make things as stress-free for BOTH of us I deploy a few tricks before he even enters the room. 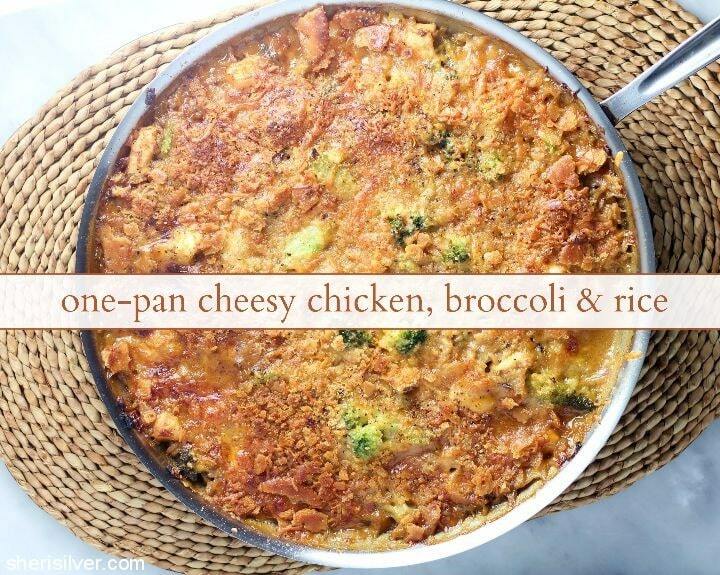 And I’ve used this delish, one-pan dinner to illustrate! I was excited to create an easy weeknight meal using Uncle Ben’s Ready Rice. 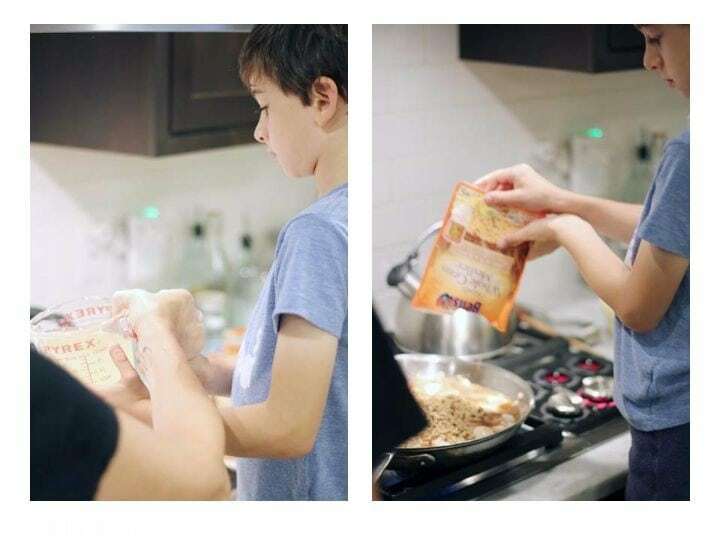 One of my favorite “cooking with kids” hacks is the use of shortcut ingredients. They save time, mess and clean-up, allowing young kids to get right to the good stuff – rolling, pouring and stirring! “Ben’s Beginners” was inspired by the mission to get kids to cook as well as they can read and write. Check out the Ben’s Beginners site for more information and other great family-friendly recipes. And right now you can enter a fabulous contest for the chance to win $15,000 AND a $30,000 cafeteria makeover for your school! 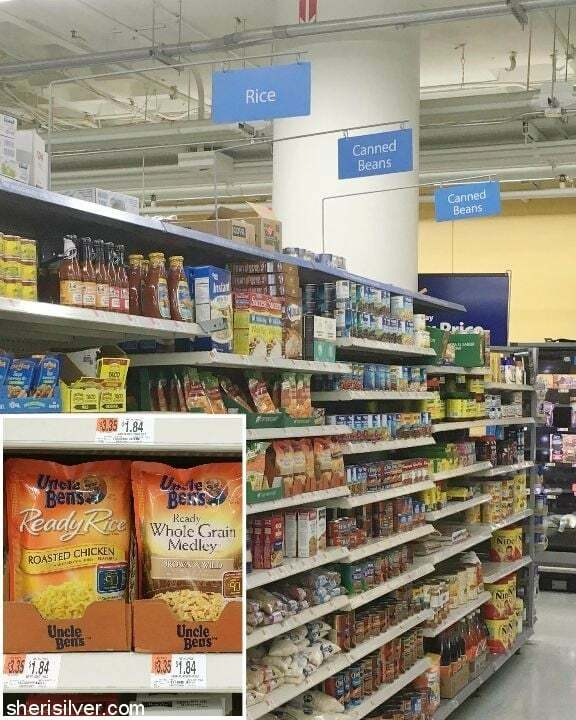 I picked up everything I needed in addition to the rice – including other fave shortcuts like shredded cheese and flash-frozen broccoli florets – at Walmart (Ibotta users can take advantage of a $0.75 off Ready Rice products offer here). You could take this even further by using pre-cooked or rotisserie chicken. Earlier in the day I got most of the ingredients prepped so that we’d be ready to go as soon as we got home. 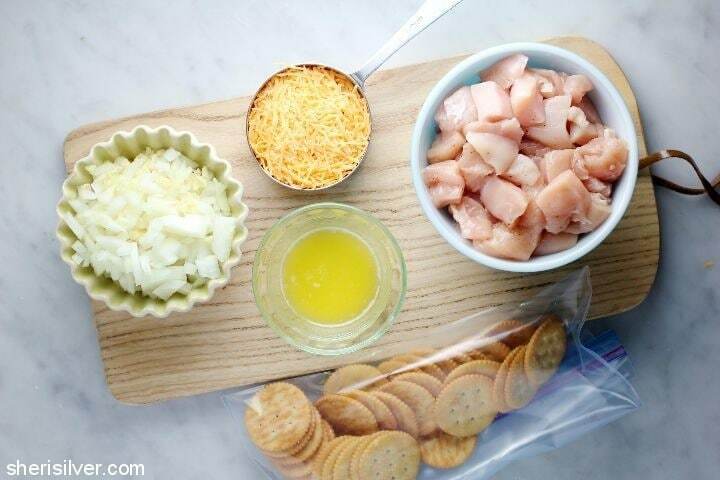 This included chopping the onion and garlic, cutting up and seasoning the chicken, and putting the crackers and butter into their respective bags and bowls. While the oven was heating up, Noah rolled the crackers into crumbs and added the melted butter and shredded cheese. Can you tell this was his favorite part? I sauteed the onion and garlic and cooked the chicken while he played, and then called him back in to add the rest of the ingredients and stir everything up. Dinner was on the table 30 minutes later and clean-up was a snap – critical for a busy weeknight (or any night, for that matter). And we all agreed this was a keeper. We certainly don’t do this every night, but once or twice a week we get some extra time together, doing something a little different, and Noah gets bragging rights for dinner. Place the Ritz crackers in a large ziploc bag and seal. Use a rolling pin to crush. 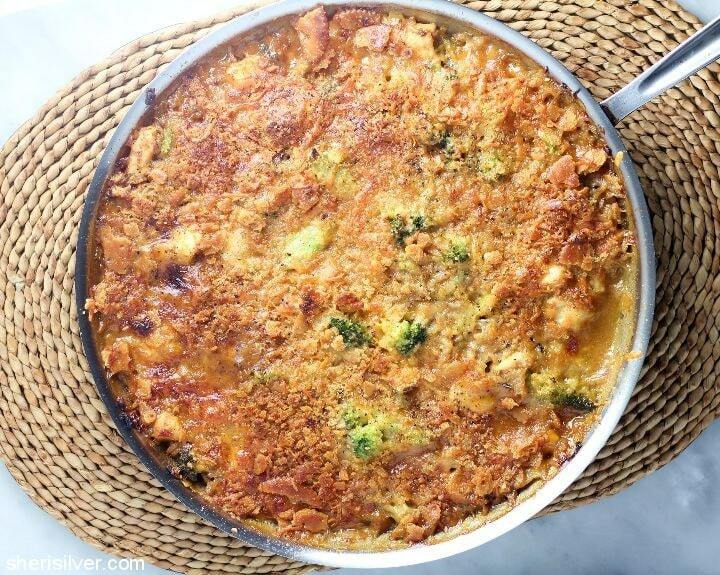 Toss with the melted butter and one cup of cheddar and set aside. Heat a large (12″) oven-proof skillet over medium-high heat. Add 1 tablespoon olive oil and heat till hot but not smoking. Saute the onion and garlic till softened – about 5 minutes. Add the remaining 2 tablespoons oil and chicken pieces and cook, stirring frequently, till chicken is lightly browned and cooked through. 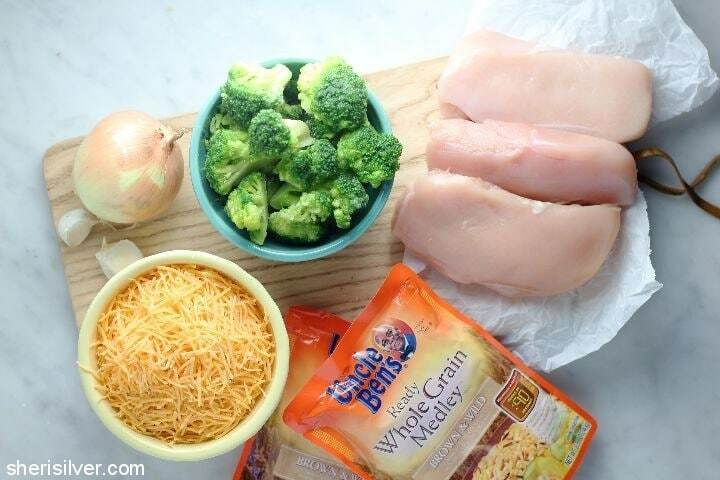 Add the broth, rice, broccoli and remaining cup of cheese – stir well and season with salt and pepper. Top with the cracker/cheese mixture and bake for 30 minutes, till browned and bubbly. For more recipes and inspiration be sure to check out the Ben’s Beginners site – how do you sneak in “together time” these days?